Plastic pirates party paraphernalia. 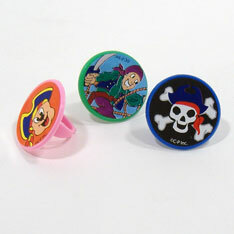 1 ½ inch disc rings with assorted pirate themed images from sailing ships to skull and crossed bones. Sold by the gross (144 pcs). $4.65 per gross for 25 gross or more. $4.00 per gross for 50 gross or more.